For other uses, see New Frontier (disambiguation). Header of the New Frontiers program website, as of January 2016. NASA is encouraging both domestic and international scientists to submit mission proposals for the program. New Frontiers was built on the innovative approach used by the Discovery and Explorer Programs of principal investigator-led missions. It is designed for medium-class missions that cannot be accomplished within the cost and time constraints of Discovery, but are not as large as Large Strategic Science Missions (Flagship missions). There are currently three New Frontiers missions in progress: New Horizons, which was launched in 2006 and reached Pluto in 2015, Juno, which was launched in 2011 and entered Jupiter orbit in 2016, and OSIRIS-REx, launched in September 2016 towards asteroid Bennu for detailed studies from 2018 to 2021 and a sample return to Earth in 2023. The New Frontiers program was developed and advocated by NASA and granted by Congress in CY 2002 and 2003. This effort was led by two long-time NASA executives at Headquarters at that time: Edward Weiler, Associate Administrator of Science, and Colleen Hartman, Solar System Exploration Division Director. The mission to Pluto had already been selected before this program was successfully endorsed and funded, so the mission to Pluto, called New Horizons, was "grandfathered" into the New Frontiers program. The 2003 Planetary Science Decadal Survey from the National Academy of Sciences identified destinations that then served as the source of the first competition for the New Frontiers program. The program name was selected by Hartman based on President John F. Kennedy's speech in 1960, in which he said "We stand, today, on the edge of a New Frontier." Examples of proposed mission concepts include two broad groups based on Planetary Science Decadal Survey goals. New Horizons, a mission to Pluto, was launched on January 19, 2006. After a Jupiter gravity assist in February 2007 the spacecraft continued towards Pluto. The primary mission flyby occurred in July 2015 and the spacecraft was then targeted toward one Kuiper Belt object called (486958) 2014 MU69 for a January 1, 2019 flyby. Another mission that was considered with this mission was New Horizons 2. Investigate and characterize the three-dimensional structure of Jupiter's polar magnetosphere. OSIRIS-REx stands for "Origins, Spectral Interpretation, Resource Identification, Security, Regolith Explorer", and was launched on 8 September 2016. This mission plan is to orbit an asteroid, at the time named 1999 RQ36 (now 101955 Bennu), by 2020. After extensive measurements, the spacecraft will collect a sample from the asteroid's surface for return to Earth in 2023. The mission, excluding the launch vehicle, is expected to cost approximately $800 million. The returned sample will help scientists answer long-held questions about the formation of the Solar System and the origin of complex organic molecules necessary for the origin of life. Asteroid Bennu is a potential future Earth impactor and is listed on the Sentry Risk Table with the third highest rating on the Palermo Technical Impact Hazard Scale (circa 2015). In the late 2100s there is a cumulative chance of about 0.07% it could strike Earth, therefore there is a need to measure the composition and Yarkovsky effect of the asteroid. Competition for the fourth mission began in January 2017. NASA selected two proposals for additional concept studies on December 20, 2017, will select a winner in the competition in 2019, and launch it by 2024. Investigators may propose the use of Multi-Mission Radioisotope Thermoelectric Generators (MMRTG), and the NASA Evolutionary Xenon Thruster (NEXT) ion propulsion system. The development cost cap is approximately $1 billion. The Decadal Survey recommended the Io Observer and Lunar Geophysical Network proposals for New Frontiers 5, in addition to the previous recommendations. NASA's Planetary Science Division responded to the Decadal Survey with support, stating that the recommendations appear well-aligned with the agency's goals. Comet Nucleus Dust and Organics Return (CONDOR), to retrieve a sample from 67P/Churyumov–Gerasimenko. Comet Rendezvous, Sample Acquisition, Investigation, and Return (CORSAIR) would sample comet 88P/Howell. Oceanus, an orbiter to investigate Titan's potential habitability. Dragonfly, a rotorcraft that would fly over the landscape and oceans of Titan to study prebiotic chemistry. Enceladus Life Finder (ELF), an astrobiology orbiter to Enceladus. Saturn PRobe Interior and aTmosphere Explorer (SPRITE), an atmospheric probe to investigate Saturn's atmosphere and composition. Venus In Situ Atmospheric and Geochemical Explorer (VISAGE), a Venus atmospheric probe and lander. The two finalists, announced on 20 December 2017, are Dragonfly, which would send a mobile robotic rotorcraft to Saturn's moon Titan , and CAESAR (Comet Astrobiology Exploration Sample Return), which would be a sample-return mission from comet 67P/Churyumov–Gerasimenko; CAESAR was proposed by the Cornell University. Comet 67P was previously explored by the European Space Agency's probe Rosetta and its lander Philae during 2014-2015. The two proposals will each receive $4 million funding through the end of 2018 to further develop and mature their concepts. NASA will decide in mid-2019 which one of the two to build. ^ "New Frontiers Program Official Website (June 2016)". National Aeronautics and Space Administration (NASA). January 15, 2016. Archived from the original on June 10, 2016. Retrieved January 15, 2016. ^ a b Foust, Jeff (January 8, 2016). "NASA Expands Frontiers of Next New Frontiers Competition". Space News. Retrieved January 20, 2016. ^ NASA. "NASA to Launch New Science Mission to Asteroid in 2016". Retrieved May 25, 2011. ^ "Sentry Risk Table". NASA/JPL Near-Earth Object Program Office. July 21, 2015. Archived from the original on July 21, 2015. Retrieved July 21, 2015. ^ Milani, Andrea; Chesley, Steven R.; Sansaturio, Maria Eugenia; Bernardi, Fabrizio; et al. (2009). "Long term impact risk for (101955) 1999 RQ36". Icarus. 203 (2): 460–471. arXiv:0901.3631. Bibcode:2009Icar..203..460M. doi:10.1016/j.icarus.2009.05.029. ^ Selecting the Next New Frontiers Mission. The Planetary Society. Van Kane. 29 August 2017. ^ Clark, Stephen (September 7, 2016). "NASA official says new mission selections on track despite InSight woes". Spaceflight Now. Retrieved September 8, 2016. ^ a b New Frontiers fourth announcement of opportunity. NASA, January 6, 2016. ^ a b c Keeter, Bill (May 5, 2017). "NASA Receives Proposals for Future Solar System Mission". NASA News. Retrieved September 20, 2017. ^ Weiler, Edward J. (July 29, 2011). "Planetary Science Division Response to the Planetary Science Decadal Survey" (PDF) (Letter). Letter to Charles F. Kennel. ^ a b c d e "Proposed New Frontiers Missions". Future Planetary Exploration. August 4, 2017. Retrieved September 20, 2017. ^ COmet Nucleus Dust and Organics Return (CONDOR): a New Frontiers 4 Mission Proposal. (PDF) M. Choukroun, C. Raymond, M. Wadhwa. EPSC Abstracts. Vol. 11, EPSC2017-413, 2017. European Planetary Science Congress 2017. ^ CORSAIR (COmet Rendezvous, Sample Acquisition, Investigation, and Return): A New Frontiers Mission Concept to Collect Samples from a Comet and Return them to Earth for Study. (PDF) S. A. Sandford, N. L. Chabot, N. Dello Russo, J. C. Leary, E. L. Reynolds, H. A. Weaver, D. H. Wooden. 80th Annual Meeting of the Meteoritical Society 2017. ^ a b "Dragonfly: Titan Rotorcraft Lander". The Johns Hopkins University Applied Physics Laboratory. 2017. Retrieved September 20, 2017. ^ Redd, Nola Taylor (April 25, 2017). "'Dragonfly' Drone Could Explore Saturn Moon Titan". Space. Retrieved September 20, 2017. ^ Enceladus' Subsurface Energy Source: What It Means for Search for Life. Calla Cofield, Space.com April 14, 2017. ^ Back to Saturn? Five Missions Proposed to Follow Cassini. Kenneth Chang, The New York Times, 15 September 2017. ^ McIntyre, Ocean (September 17, 2017). "Cassini: The legend and legacy of one of NASA's most prolific missions". Spaceflight Insider. Retrieved September 20, 2017. ^ Saturn PRobe Interior and aTmosphere Explorer (SPRITE). Simon, Amy Banfield, D. Atkinson, D. Atreya, S. Brinckerhoff, W. Colaprete, A. Coustenis, A. Fletcher, L. Guillot, T. Hofstadter, M. June 11, 2016. ^ Venus Origins Explorer New Frontiers Proposal. Future Planetary Exploration. 1 October 2017. 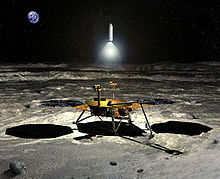 ^ a b Finalists in NASA’s Spacecraft Sweepstakes: A Drone on Titan, and a Comet-Chaser. Kenneth Chang, The New York Times. 20 November 2017.